Spring has sprung and wedding season is just around the corner! There are so many 2019 brides who are fully in wedding planning mode right now, daydreaming about their walk down the aisle and the moment their partner says “I do” to forever. Something that many brides (and grooms!) overlook in all of the wedding planning excitement is their smile! Trust me, you’ll never smile more than on your wedding day, so you really want to feel confident that your pearly whites are as sparkly and bright as they could possibly be. Think of all of the photos that will be taken and all of the guests you’ll be mingling with! Wouldn’t it be great if everyone saw the best version of you? Of course it would! There’s no better time to get a Zoom® whitening treatment than before your big day. In fact, we recommend scheduling it a little earlier so you have the perfect smile for your engagement photos, bridal shower, and your bachelorette party! However, if it’s a little too late for that, it’s still well worth it to get it done before your wedding day. Zoom® whitening treatment utilizes the same basic methods as most whitening gels, but with results that are noticeably superior to alternative products. This is because professional whitening contains a higher concentration of hydrogen peroxide for a stronger effect. 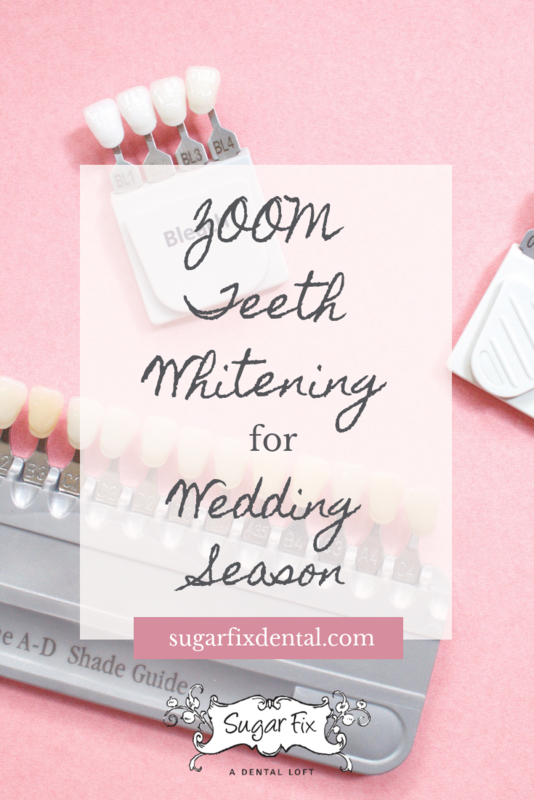 So, if you are looking to create a whiter smile fast — like in time for your wedding — Zoom® is a great solution! Surface stains on the teeth can make our smiles appear yellowish, which is not what we want… especially in our wedding photos! The Zoom® whitening treatment is a super fast way to get rid of the yellow and get your teeth white and bright again. If your teeth are more of a gray tone, the KöR Whitening Deep Bleaching™ system is a better option for you. This system is excellent at removing discoloration due to tetracycline (a popular and widely used antibiotic). When prescribed to children under the age of 8, it can cause tooth discoloration. We see a lot of adult patients who had tetracycline as children and we are able to reverse the discoloration with KöR Whitening. However, if you have surface stains from foods and beverages or from smoking, Zoom® whitening treatment will be super effective, and it only takes about an hour in the office! Something exciting is happening next door! White Haute Teeth Whitening Bar will be launching in a few weeks in Sugar Fix’s second space, which means you’ll have another convenient option for teeth whitening in Lakeview! We will be offering quick, 15-minute flights of white, which means you can get a sparkling white smile in no time. Perfect for weddings, special events, or just for getting your smile in tip-top shape so you can feel a little more confident. Watch our Instagram page for updates on our grand opening!